Fixed issue when viewing user tanks page for a user with no internal tank data on record. Fixed loading element filling screen on clan application viewing page. Fixed invalid HTML code in clan tank list. Reduced minification of JS to improve debugging. Added code to enable detection of "inactive" clans (determined by a lack of codes entered or replays uploaded), allowing such clans to have automated actions (loading battles, generating daily codes, etc...) frozen to save resources. Removed underlying code for loading stats and removed all player stats from database. Removed files which are no longer needed. Due to coding error all existing API Tokens are no longer considered valid by WG's API. As such, you'll need to create a new API Token (https://clantools.us/account/settings/tokens) to replace any existing token. Sorry for the trouble. 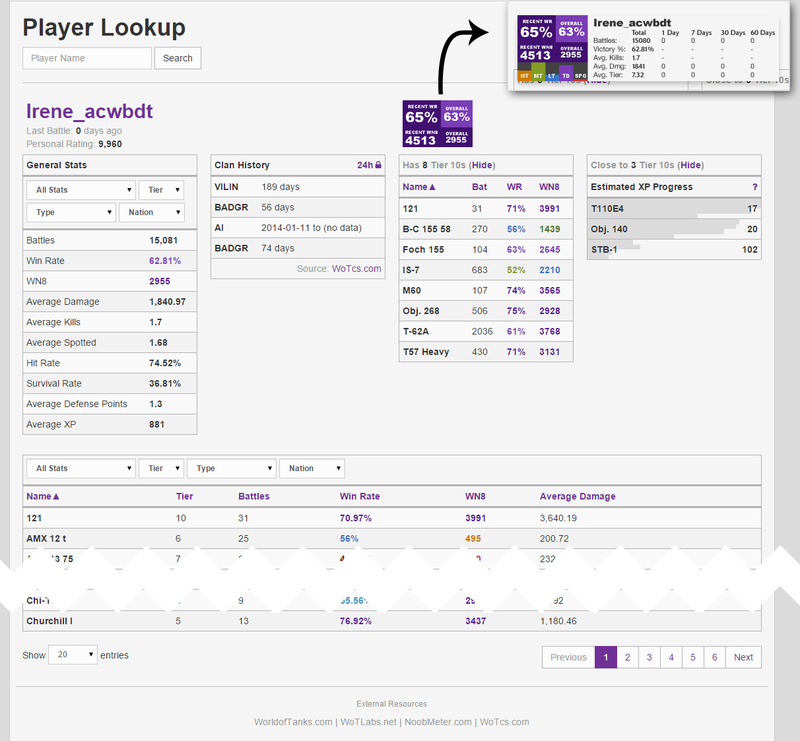 Similar to the player lookup, there's now also a clan lookup. It still has room for improvement, however there's enough there already that I feel it's worth releasing. Accessable via the Tools dropdown, or just click here. For an effective summery, see the image below (click for larger version). 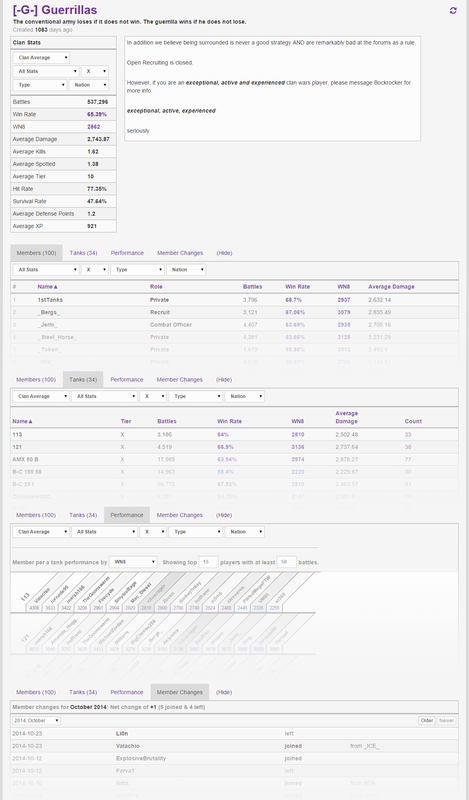 The Clan's Tank page has also been replaced by the combination of the tanks and performance tabs, though the tank list also includes a more detailed view of available tanks. Known Available won't be very useful without having your members add an API Token on Clan Tools (https://clantools.us/account/settings/tokens) as it only shows confirmed in garage tanks (which requires an API token from that user to get their in garage status) and which are unlocked. Possibly Available is effectively the same as what was shown as available before as it shows unlocked tanks that are known to be "in garage", or that there is no in garage data for. Available Maximum shows what is effectively the same as "count" on the clan lookup page, and is effectively just a simple count of every member for which that tank was reported by the WG API. Everything isn't objectively better though, as everything (except in garage and tank locking) is retrieved from the WG API each time. Previously the Clan Tools server loaded this data once a day and served the statistical information that way. This was extremely costly. For the 1,764 users with stats being tracked, there are 786,868 database entries for stats alone. Though the bigger issue was the time it took to load this data, which was around 30 minutes (for 8 clans). This simply wasn't scalable, nor an effective use of the limited resources available to Clan Tools. As such, while I understand the longer waiting times are less than ideal, they are a necessity. In Garage data now correctly reflects if the data isn't available (due to the lack of an API token for the user). The player's tank page now sources its data from the Wargaming API, rather than pulling stats from Clan Tools. The In Garage and Tank Locking data is still provided by Clan Tools, so no information has been lost. I've added a link to matches and removed the link to payouts on the clan home nav dropdown. My personal view is that the nav dropdown should have links to pages which are likely to be used at least one a day; payouts is more a once a week sort of thing. On the other hand, matches (if used) is something which is likely to see daily use. Added Average Tier to player lookup. Missing WN8 expected values are now calculated using the formula listed here: http://forum.wotlabs.net/index.php?/topic/9786-wn8-expected-values-update/?p=299540 Note that this relies on the tank entry being reported by the WG API, so there still may be missing tank WN8's at times. Updated Player Lookup footer to reflect WN8 expected tank values table source. Player lookup lists now have smarting sorting behavior (stats default to descending order when first sorted). Removed not Once Per a Day restriction on code types granted via replays. Updated Create Token page to take into account changes to how WG deal with tokens. Player lookup tank list having no default sorting. Codes automatically created by creating a new match now use the correct date based on the for date. Adding a replay to an existing match failing due to a missing link in information propagation. Issues caused by tanks missing from clan tools, but not the WG API. API Tokens not being sent when mass refreshing clan member data. Error when attempting to filter by in garage. Note: Some might have noticed that this post seems a day or two late; for various reasons this didn't end up getting posted until today. When calculating WN8, tanks which are missing from the WN8 expected stats table are simply ignored (the people who maintain the WN8 tank data need to update the list to actually "fix" the issue, which I suspect they may not do for some time due to the lack of data). Missing WN8 values are displayed as '-'. When displaying tank information, missing tanks are not shown. WN8 tables are automatically updated from http://www.wnefficiency.net/wnexpected/ nightly. Tier is now displayed in roman numerals. Added refresh button to player lookup. Added "Days Ago" to activity report to view results for X days ago, rather than having to manually set a span. Player Lookup now remembers sorting order. Tank List deleting itself after one search on player lookup. Activity Report "Last Battle" column not sorting correctly. Activity Report defaulting to 15 days instead of 14. Attendable Days and Spans reporting oddly in some cases. Activity Report now defaults to the range ended on yesterday, to account for the possibility that attendance for the current day may not yet be complete. 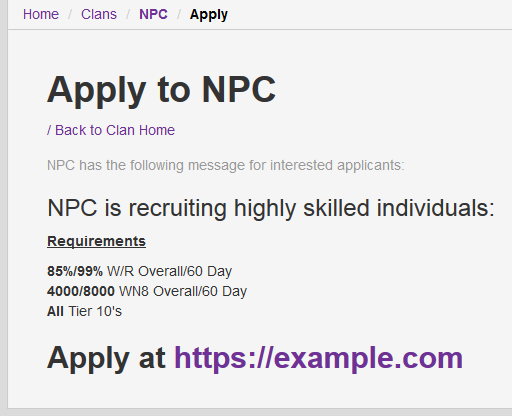 Another key feature using Clan Tools to accept clan applications was the (primarily) statistical information it provided about the applicant in one place. I wanted to expand that featureset to all of the clans using Clan Tools, and anyone else idealy. However, the system I was using simply wasn't capable of performing "on the fly" lookups. So I started from scratch, and the result is by far better than the original system it was trying to mimic, while also being much less resource intensive to the server. Accessable via the Tools menu (Tools > Player Lookup), or you can just click here. Redesigned clan application viewer to integrate with the player lookup feature better, in addition to handling long responses to questions better. Encounter battles now correctly report both maps, rather than pretending to actually know which map it will be. Once a replay is uploaded, the map the battle actually took place on will be the only one shown. This change is not retroactive (already loaded battles that don't have replays will still just show one map). Added a third info state to the battle start time info, "st" for start at, which is displayed after the "op" (open at) time as passed, but before the battle start time. The replay results page using the full tank names because the short tank names hadn't been loaded. Reworded percent reserve option for payouts to be easier to read. Added new percent reserve option which doesn't adjust for the previous reserve being in the given treasury option. See this for more details. The reserve amount is now shown in the reference payout list. Advanced reserve calculation section is no longer hidden in an advanced option submenu. Set a default for the day multiply empty mode. For some time now Clan Tools has supported players applying to participating clans through Clan Tools; however, not everyone may want to use Clan Tools for dealing with clan applications. Still, clans that did had the option to have various (at this point minor and likely completely ineffective) bits of advertising, which wasn't fair to the clans who didn't want to use Clan Tools for this. In an effort to fix this, two new clan application modes have been added: Displaying a message (with support for formatting via markdown) and redirecting to another site (which is really just a short cut for a message with a link). Of the two choices, I would highly recommend taking the additional time to write a short message, even if you still want to redirect to another website because result is much better, as shown below. I've moved editing a user's groups to a different page labeled "Edit Account Groups", it should show up directly under the edit account settings link. Changed clanwars URLs to servers, though the old URL will still work, all links will be to the new URLs. Switched to tank's short names for the replay details. Added ability to search match replays (accessible from matches page). Replay details player list should now disregard case when sorting. Issue preventing viewing battle replay stats. Error when entering a date in the future in the match date selector.